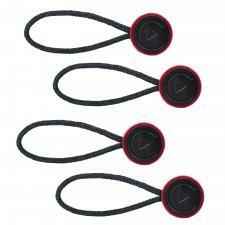 Micro Anchor 4-Pack is a pack of 4 additional Anchor attachments for use with the Leash and Cuff. These Anchors are the same as the Anchors that come with the Peak Design Leash and Cuff products. With spare Anchors, you can use your Leash and Cuff with additional camera bodies, or other objects like wearable POV video devices, binoculars, compasses, water bottles, toddlers - the possibilities are endless! Each Anchor is made from braided Kevlar® cord overmolded with Delrin® thermoplastic. An individual Anchor can withstand over 100 lbs. of force (around 45kg of force) and is designed to be safely used with cameras and lenses of any size and weight. At the size and weight of a US penny, the Anchor doesn't add any extra bulk or weight to your camera, and will not scratch the finish of your camera either.